SoftPlanet makes it possible for everyone to get free Trojan Killer download directly from our servers. There is no registration needed for downloading. Computers are a nice thing – they connect you with friends and family, they help you work faster and better, they provide enjoyment in the form of games, they can find all the information you need in no time. But just like anything else they also need maintenance if not on the outside then on the inside. In a few words you have to scan your PC for viruses and malware every once in a while just to make sure it runs smoothly and with no problems and if you find malicious software to get rid of it. There are numerous tools out there that do the job with some of them being paid while others being free. Trojan Killer 2.2.7.0 is an example of a free malware cleaning program and it can really help you in your battle against bad software. Trojan Killer shares a lot of traits with other similar programs. Its main goal is to eliminate dangerous software from your computer and this is it – but it is not little. The app comes with a nice interface that is not hard to understand before you can start using it. This makes this program very easy to use and in addition most functions are fully automated so you don't have to worry about updates, scans and other similar things. Another plus of the program is that it has a fast scanning engine so you won't have to wait for a long time to scan your entire PC. The interface of Trojan Killer resembles most other programs of the same category. There are a few simple drop-down menus in the upper left corner that offer a number of functions and an icon bar on top that is used to perform all the actions that the program offers. You can use it to scan your PC, update the malware definitions, check the protection status of your PC, use tools, check settings and more. The rest of the program window area is occupied by information that the program gives to you like scan progress, malware found and other similar information. We are pretty sure you already know how to use this application but we will say a few words here too. In order to scan your PC and feel safe you must first run this program and update its malware definitions. Then run a scan and if it does not find anything – good! If it does you will be given the options to ignore, delete and put into quarantine the dangerous file and then Trojan Killer 2.2.7.0 will scan your PC once again to make sure that everything is fine. A nice thing is that the application is almost fully automated so you won't have to think of updates, scans and more. The bad news is that this tool is paid but sometimes we can't have everything in life for free. Trojan Killer 2.2.7.0 is a nice application that will help you protect your PC by finding and eliminating malicious software from your PC. It is easy to use, it is fast and automated and it simply works. Some of you may find the fact that this utility is paid as a negative but sometimes you can't have everything for free and often security is more important than a few dollar bills. So go ahead, try this program and if you like it get a valid license online. Our security scan shows that Trojan Killer is clean from viruses. 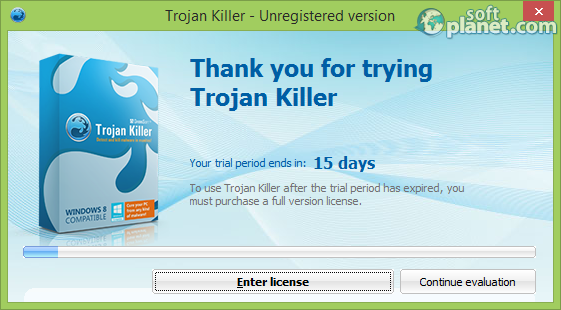 The current version of Trojan Killer has been scanned by our system, which contains 46 different anti-virus algorithms. That ensures that Trojan Killer 2.2.7.0 is 100% safe for your computer.